Please note on Total Fire Ban days with a Fire Danger Rating of Severe and above , the Centre will be closed and all activities will be cancelled. Suitable for any ability, fitness level and age. Increase muscle tone and strength, flexibility, coordination and balance. Improve posture. Safe rehabilitation of injuries. Helpful for stress management and relaxation. 7 pm to 8:30 pm NEW NIGHT!! 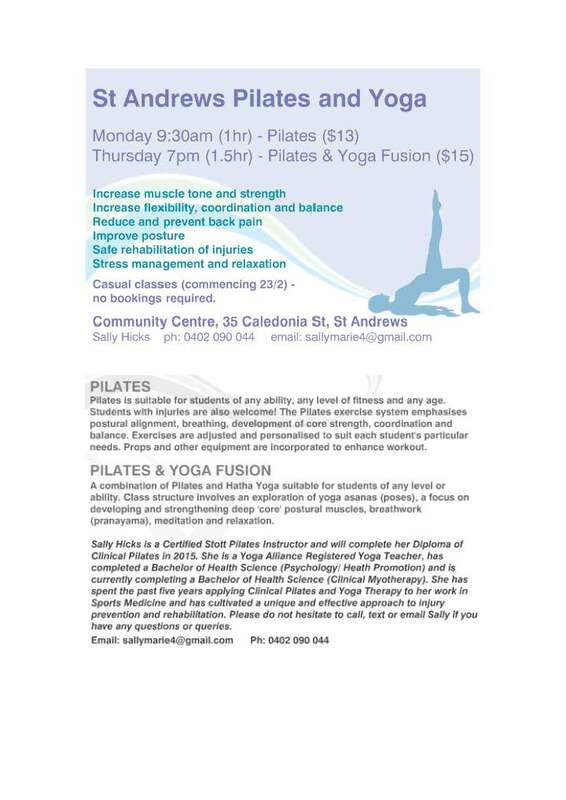 A combination of Pilates and Hatha Yoga suitable for students of any level or ability. The focus is on developing and strengthening deep core postural muscles, breathwork, meditation and relaxation. An extended led practice allowing time to explore anatomical integrity, add a wider range of posture, and cover extra practice elements such as meditation and deep relaxation. Tai Chi, often described as a moving meditation, has many established benefits for mind and body. As well as promoting mental tranquility, Tai Chi is satisfying to learn, protects and mobilises joints, improves balance and the functioning of heart, lungs and immune system. It assists in maintaining bone density and muscle health. These classes are designed for both the short and the long term student. Yoga is for everyone.Core abdominal strengthening,reset your posture and actively lower your stress levels through mindfulness. Suitable for beginner through to advanced levels. This class will build your balance, strength,motivation and heart fitness. Easy to follow fun moves to keep you active through the whole year. Suitable for all ages ! beginners very welcome. A gentle meditation to warm your heart and nourish your soul, perfect for these cold wintry times when we need to nurture our insides mind, body and soul. The Full Moon will inspire our meditation as we practice forgiveness, release and gratitude with love, peace and joy. Come for Craft, coffee and a chat. Bring along whatever you're working on or start something new. Come and share your ideas for new courses and projects, share your skills. We have a sewing machine and some knitting and quilting supplies for use. All items are handcrafted original designs and include art, photography, card, textiles, wood, ceramics, jewellery, sculpture, clothing, toys, home decor items and more. Francophiliacs is a Social French conversation group for anyone interested in French language and culture. We chat about our lives, introduce each other to places in France, discuss events and enjoy some food and wine. Don't worry about your level of French; we are all a bit rusty. We meet at the community centre at 7.30 pm once a month. Bring a 'plate' and French wine optional. Cost: gold coin donation and $5 SACC membership fee (payable annually to cover any classes/activities you attend for 2017).